Get sharing across multiple networks from your Me Tile back on Windows Phone 8.1 with UniShare! 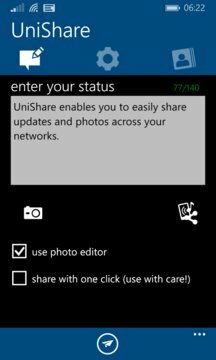 Unishare not only integrates into the Me Tile for posting updates, but also into a lot of other places on your phone (like sharing from other apps, photo sharing). 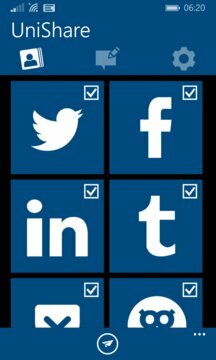 UniShare currently supports Twitter, Facebook and LinkedIn (standard). In app you can purchase a more package that unlocks more networks (Yammer, Tumblr, Geeklist and Pocket (for saving links), with more networks to come). We are using the official Facebook app ONLY for login. Posting to Facebook is done from within the app. We added also sharing with your groups and pages (unlock via in-app-purchase). Please note that UniShare is a public beta in its current state. Your feedback is always welcome (please use the feedback options in app).